This past Thursday was the finale for the 8th season of Project Runway, one of my favorite shows. All things considered, it really wasn't that great of a season, but there was one major stand out contestant, Mondo Guerra. He, of course, did not win. The winner was Gretchen Jones, with a self-professed '70s aesthetic. It seems, though, that much of the Internet community agrees that Mondo was a clear winner. His perspective was quirky and colorful. Throughout the season, Mondo was the one contestant who was not afraid to play with pattern and color, and he did it well. 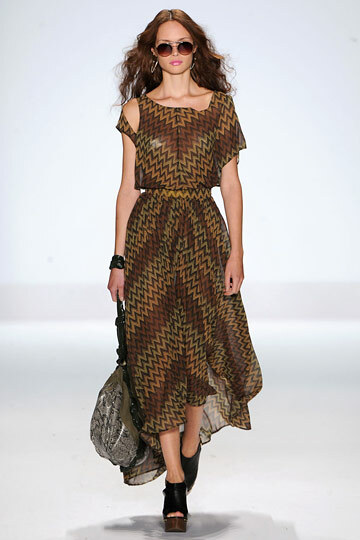 This talent held through the finale with bold plaids, bubbles and tribal prints mixed with pinks, teals and yellows. It was a fun collection to watch. Gretchen's, on the other hand, was a blah mix of browns, browns and more browns in plain prints. It wasn't anything special, almost everything looked the same. Andy South, the third finalist, had a similar problem. Except, rather than everything being brown, it was all green and grey. Throughout the season, he had erred towards dark colors, so I wonder if he was afraid to do more of the same and have the judges criticize a lack of variety. However, he went too far in the other direction and it was pretty boring. Although, I will say, the pieces themselves, in terms of form, were much, much better than Gretchen's. What annoyed me most about this season and especially the finale was the seeming hypocrisy in the judges' critiques. They eliminated Michael C. (who was in the final four) because the three pieces of his final collection he showed them lacked variety in color. Yet, Gretchen's entire collection lacked color, and they seemed to overlook that. Another point of hypocrisy was that, in the previous episode where they showed the three pieces, they criticized Gretchen's for being too commercial and only showing separates. However, in the finale, they praised her for creating a collection (same collection) that could be sold in a department store. I guess that's just how it goes sometimes, though. Click here to see the three final collections, plus seven "dummy" collections by eliminated designers! I have been a Harry Potter fan ever since I picked up the first book way back in the 6th grade (13 years! ), so, naturally I am very excited for the final films in the series. I was even more excited to read a recent news post that seemed to indicate a strong influence of fashion in the last films. Although it alludes to a growing controversy within the costume department, it's still great to see how strong an influence the world of fashion is exercising within other media. So, here's the situation: The next film features a wedding scene with Fleur Delacour (played by the gorgeous Clemence Poesy). The film's costume designer, Jany Temime, designed a wedding dress that was quite similar to a design from Alexander McQueen's Fall 2008 collection. Looking at the pictures, there is no doubt that the dress is a copy, in my opinion at least. The only differences seem to be the length of the dress and the birds' heads on the bodice. I sincerely hope that the costume designers gives credit where credit is due. It's a gorgeous dress and I do truly feel that it fits the mood of the films and characters. In the US, singles and albums are typically released on Tuesdays. So, every Tuesday, I will give a list of those new albums, EPs, singles and so on that I'm excited about. Today, Avey Tare (of Animal Collective) released his first solo album. I haven't had the chance to listen to the album yet, but I was able to preview some of the songs on NPR a few weeks ago. I definitely liked what I heard. I would suggest it if you're already an Animal Collective fan, or like any of the previous solo work put out by its members, such as Panda Bear. Read an album review here, and listen to the lead single, "Lucky 1," here! Also on the new music front is a new single from Lykke Li, "Get Some." She gained some fame about two years ago with the song "I'm Good, I'm Gone." From the sound of the new single, she's definitely grown in her sound. Her first album was good, but perhaps a bit twee-sounding. The new single starts off with a heavy percussion sound (which I love!) and the lyrics are a bit bolder. I especially love the line: "I'm your prostitute, you gon' get some, like a shotgun needs an outcome." I can only hope the album reflects this change in direction. I am in love with the new H&M ads that have been running during the last couple of months. The ads feature models Daria Werbowy, Malgosia Bela, Noah Mills & Jon Kortajarena. The ads have three shots of the model playing alongside each other at once. They're playing with the clothes like they're in a fitting room trying them on. In the background is an absolutely amazing rendition of "Mannish Boy" by Erykah Badu. My favourite is the "Cardigan" ad featuring Jon, he is gorgeous, and his smirk at the beginning of the ad makes me swoon. I first got into The Duke Spirit after seeing their video being played at an American Eagle Outfitters and immediately fell in love. The lead singer, Leila Moss, looks a bit like Debbie Harry of Blondie, cute, blonde and extremely stylish. Their music is like a somewhat calmer version of garage rock with amazing vocals, husky, yet surprisingly delicate, wafting over. I heard of them back in 2008, which is about when they released their last album, Neptune. I played that album to death. Their first album ain't bad either. Anyways, this is all a big set-up to the point of this post...THEY'VE RELEASED A NEW SONG!!!!!!! This morning, at about 8 AM, AudioPorn Central informed me of the new song, "Everybody's Under Your Spell," accompanied by a video. While they seem to have gone more mainstream in their rock style, it's still a great song and all of the best parts of the band are still there, especially the great vocals. If you like the song, the band made it as a free download on their website. I will definitely be the first in line to buy their new EP, Kusama on December 7. Well...digital line, since it's exclusive to iTunes. Below is a recording of "Into the Fold," my personal favourite. I would consider myself to be a music junkie...literally. I honestly get twitchy when I haven't found any new hotness in a few weeks. It seems like everyone recently has been urging to try vinyl...friends, Pitchfork (hey 50% hispter, remember? ), I hear about it EVERYWHERE!!! So, I decided to start exploring vinyl to listen to some of my favourite music. I spent some time looking around Bloomington for good players. I really didn't know where to start...one store, Tracks, only had used models and everyone of them looked this they needed some replacement part. Urban Outfitters had some nice models, but of course, there were a bunch on display, but none actually in stock. I finally found a pretty nice model at Target that I ended up buying. Next was finding some good albums to start off my collection. There are A LOT of good places to buy vinyl in Bloomington, TDs, Tracks, Landlocked. I started at Landlocked. I got Neutral Milk Hotel's On Avery Island and In an Aeroplane over the Sea, Fleet Foxes' album and Band of Horses' Cease to Begin (which I technically got at Tracks). All of these albums sound great on vinyl, but my favourite by far has been Beirut's The Flying Cup Club. The album, in general, is amazing, I've been beyond obsessed with it for the past few weeks now. On vinyl, however, it's just beyond. Best song, BTW, "Cliquot. "I absolutely love the French title!! Anyways, so that's what I'm listening to now, right now, in this moment, as I speak, it's beautiful. And just so you all know, I am a name dropper, it's gonna happen...a lot. I do suggest you check out those artists that I ever may mention, they're pretty much awesome. My name is Joy and in this, my first blog post, I want to give a little background about me and why I decided to start this blog. I am a graduate student in the Kelley School of Business at Indiana University studying Information Systems. I also did my undergraduate work at Kelley in marketing. I am a Hoosier gal, raised, but not born. I grew up outside South Bend, Indiana. Although I've been here all my life, I am more than ready to leave Indiana, and likely the Midwest, once I've finished my degree. This isn't technically the first blog I've done, I was on Xanga back when that was still cool. That was more of a personal blog and, moreso, a place to rant. This is not what I aim for in this blog, though elements of my personal life will, of course, be present. In my time at Indiana University, I have developed a passion for music, art and fashion, all of which I plan to talk of at length on this blog. I want to use this blog as an opportunity to further explore and espouse on these passions. As for the title of this blog, it's how I've come to define myself over the past year or so. The hipster culture is one that fascinates me, and many of the people I associate myself with could be defined as such. However, I feel that my tastes and preferences set me apart from what many usually associate with the hipster culture. Hopefully this blog will serve as a good representation of myself.